With MicTester you can acquire the digital signal of the microphone channel. This signal can be visualized and zoomed up to see a single sample or saved to a .csv file for further elaborations. 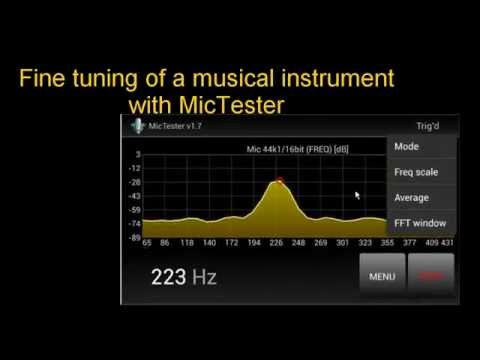 MicTester is also a Real Time Analyzer (RTA) and allows you to perform a very accurate audio spectral analysis of the signal. Automatic identification of musical notes help you to detect the pitch of a sound, making easy to tune a musical instrument or to train your own voice. Like a true oscilloscope, MicTester features a trigger circuit that allows you to easily capture a single pulse or non-repetitive sequences. You can also use MicTester as a sound level meter and measure A-Weighted SPL according to IEC61672. The app supports several type of sources (MIC, CAMCORDER, VOICE COMMUNICATION, VOICE RECOGNITION) and can operate in stereo mode on devices having two internal microphones. MicTester can also analyze WAV signals (16/24 bit) streamed via TCP/IP. If you smartphone features an accelerometer, you can use it with MicTester for vibration analysis at infrasonic frequencies.